Last week I posted a pretty glowing review of Liberty Tax Service’s franchise model. In short, I basically fawned over the stuff Liberty does really well. I then suggested that you and I need to emulate the smart stuff that the good franchisors do. This week I’m going to talk about some stuff that isn’t quite so, well, positive. Specifically, I want to talk about franchisee profitability, franchisee failure rates and then the “bad” stuff common to franchise agreements. In the paragraphs that follow, I’m going to use the example of Liberty Tax’s franchise model. But I believe that what I’m saying here about Liberty Tax surely applies to most other franchisor models too—just as the positives of the Liberty Tax franchise model also apply to most other good franchise models. A first really important point: A franchisee pays a very hefty price for the smart product design and the clever collection of best practices that the franchise supplies. The franchise agreement with Liberty, for example, currently appears to require a 14% royalty, a 5% national advertising fee and that you buy some products and services from vendors who rebate a commission to Liberty. There’s nothing bad or dishonest or unethical about any of this stuff. Liberty, like you and like me, wants to make a profit. But here’s the deal: A bunch of the gross profit margin “boost” a franchise operator will enjoy because of the franchisor’s cleverness goes right back to the franchisor in the form of royalties, fees and rebates. In fact, I kind of wonder if most or even all of the extra gross profit margin a franchisor helps you get doesn’t get paid back out again to the franchisor. One quick example highlights why I think this. If you look at Liberty Tax’s profile of a “standard” fifth-year franchisee operating multiple storefronts and preparing 1,200 tax returns, this operation generates about $300,000 in revenue and earns about $120,000 in profit. That’s great. Congratulations to any franchisee succeeding at that level. Note: The Liberty Tax franchise agreement would mean that the franchisee generating $300,000 in revenues pays about 20%, or $60,000, to Liberty. So consider this situation a bit… Both franchise and nonfranchise operations may make about the same amount of money if they’re the same size. And what this seems to suggest is the value created by the franchisor business model is largely captured by the franchisor. For the record, I don’t think you or I can expect the franchisor to operate a charity for entrepreneurs. The franchisor deserves its profit just as much as you or I do. But we do need to realize that the extra goodness and cleverness of the franchise formula is something franchisees at best share with the franchisor. Here’s another thing to think about: Some pretty good data (including sources such as the Small Business Administration study available here) suggest that your chances for success in a franchise-type venture look very much like your chances for success in a nonfranchise-type venture. In other words, you probably don’t dial down your risk by using a franchise-type business. Rather, you probably bear about the same level of risk of failure in a franchise venture as you would in a nonfranchise venture. Second, I think what’s very possibly happening with these failure rate statistics is the same thing that happens with the profitability stuff. In effect, the franchisor extracts the value of the franchise formula via the franchise fees and royalties. As a result, the business risk of the franchise business looks like the business risk of a nonfranchise business. A third point to make is this: While I don’t have any empirical source to back this comment up, I think that probably many of the franchisees who do fail at franchising fail because they don’t follow the franchisor’s rules. They may start undercapitalized, for example. Or they may simply ignore many of the franchisor’s systems and procedures. This sort of explanation suggests that someone who starts a franchise-type venture well capitalized and who religiously follows the formula reduces risks. Regarding this third point, however, if you look at nonfranchise business owners who start ventures using a proven formula, who start well capitalized and who follow a clear-cut business plan, well, probably those folks also reduce their risks. I’m not sure how to describe a third, final negative I see in a franchise model such as Liberty’s. But let me say that I suspect the cookie-cutter franchise agreements used by a franchisor will preclude you from doing some types of stuff that will help your small business. Let me tell you the specific example that jumped out at me, and then I’ll try to generalize a bit. The Liberty Tax franchise agreement that I received seemed to prohibit franchisees from setting up a website and using that website to market tax return preparation. Note, too, that the nonfranchisee competitors of Liberty Tax’s franchisee aren’t burdened by a similar restriction. You see the problem. And then note that the prohibition against having a website will probably not be the only example of where the franchise agreement precludes a franchisee from doing stuff that a nonfranchise operator can do to grow and profit. The end result of a cookie-cutter franchise agreement? Some of the goodness of the franchise will be eaten up by missed opportunities in other parts of a business. Thought #1: I think a well-designed franchise program—and I’d include Liberty in this category—provides a good-quality venture to entrepreneurs who follow the formula. Thought #2: Success isn’t guaranteed. People do fail. But good franchisors bring some great assets to a venture, and those assets can be game changing for people new to business or new to an industry. A final comment: I mentioned in the opening paragraphs of my first post on Liberty Tax that I ended up at the presentation because I was another entrepreneur’s wingman. You might, therefore, be interested in what I suggested to my friend: I encouraged him to go for it, to take the next step. 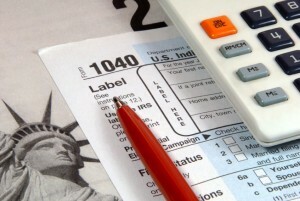 Small-business owners often don’t do a good job with maximizing their legitimate tax deductions. They don’t, for example, structure their operations to protect legitimate deductions. They often don’t do enough to create new deductions. And rarely do they understand how to recycle, or double-deduct, amounts that can be used more than once. 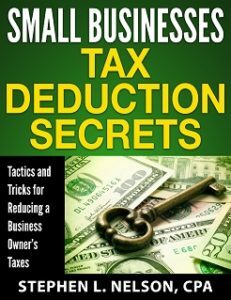 If you’re thinking after reading this that maybe you can do a better job with your tax deductions, consider our $40 e-book Small Businesses Tax Deduction Secrets. This 70-page ebook provides detailed instructions about how you can annually save thousands of dollars in income and related taxes simply by more effectively using legitimate small-business tax deductions. Interested in more detailed information? Click here. Also, we provide a money-back guarantee. If you don’t get the information you need or want, no problem. Just email steve.nelson@stephenlnelson.com and request your refund.